Just got the engine back in Andrews truck and it runs very well. Drove it down the road for a test run and the engine is fine, but while we were driving it around the main spring in the clutch broke ( Diaphragm type PP) and it will need replaced. We looked at the clutch while it was out and it looked good so we decided to just leave it in. Bad decision, now the motor has to come back out. With it being a 4X4 it is easier to pull the motor. Problem now is where to get a clutch? Advance - none available, Auto Zone - none available, Rock Auto none available!! Am I losing my mind. They built 27 million of the these trucks with the 11" clutch and NP435 transmission and I can't buy a clutch and PP! Well I am guessing someone on here has purchased one, and will help me out. Thanks for letting me vent! Are the V8 trucks with the 11" clutch the same as the slant 6? I'm not sure it was a 23 spline or a 10 spline Ill have to go look and see if I can look up from the bottom with the clutch depressed. Thanks for the AutoZone help! Post subject: What year is it? 10 spline should only exist in the 60's... if the truck is original and 70's-80's it will be 23 spline. Yep, I was able to get a small peak up between the broken diaphragm fingers and could see the fine spline. 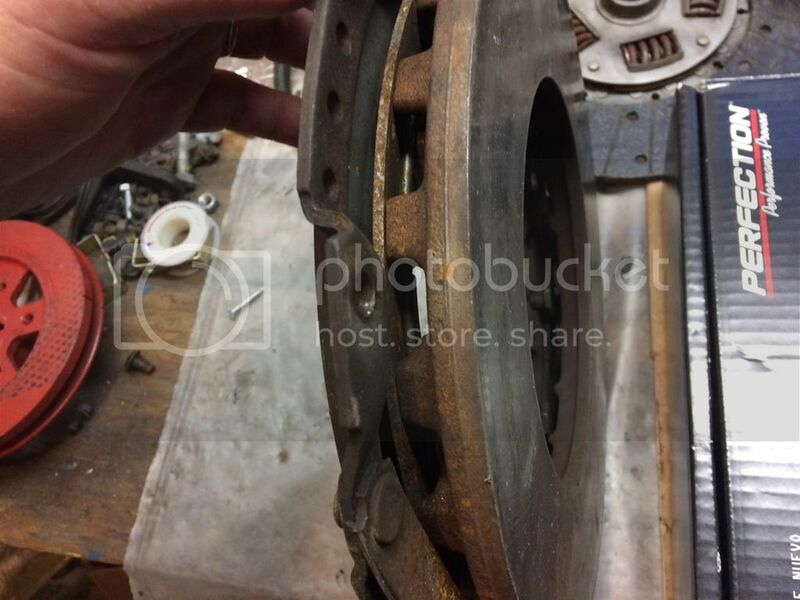 This late slant six flywheel is set for the true 11" clutch, same as big block V-8 in certain applications (not Hemi or 440 six pack), it will not use the 9 1/2" 273 clutch, nor the small block V-8 10 1/2" clutch the 318/340/360/3.9/4.7/5.2/5.9). That being said, some of the early 60's truck applications with the early bellhousing and some slant six industrial applications using this style are drilled for dual patterns that might allow for use of the small block clutch. More help please. Andrew ordered a clutch kit from Summit because he needed some other things from there. He got kit MU 5505-1B. We pulled the motor this morning and this clutch is not correct. It is an 11" 23 spline but the original pressure plate in the truck is recessed into the flywheel almost 1" and the new one is not. It also is the wrong bolt pattern. He will call Summit to return this one but I don't know if they will have what we need. The one from Auto Zone above may be correct but I can't see if it is recessed or not. Would you happen to know?? When I type in the trucks info on the Auto Zone web site it comes back as not fitting. When I ask what will fit it comes back with the 10" HD clucth which I know is not correct. I went back to their site and it is the same number as what we got from Summit. So that one is not correct either! Having trouble understanding why they don't list a clutch for these trucks when they built millions of them??? Seeing anything other than a flat flywheel behind a slant is news to me! It might be easier to keep the clutch kit you have and find a flat flywheel. Has anyone else ever seen this style before? I am assuming it is Factory but that may be a bad assumption. Anyway, I still am in need of a clutch. OK, in the Factory service manuals that I have it lists the Pressure plate as #1649 (Borg & Beck). And the clutch disc is # 14017. Any way to cross that over to something? Does anyone have a flywheel setting around? 11"? Flat? PS. FSM is no help on the flywheel at all. No pictures that I can find. I have never seen a flywheel like the one in the picture. Mine is flat like all other flywheels that I have seen. First count the teeth on the starter ring. The 11" truck clutch flywheel should have 143 teeth, The 10 1/2" and 11" scalloped clutch flywheel should have 130 teeth, the 9 1/2" and 10" truck flywheel should have 123 teeth. Also let's get this figured out before you return the clutch. That may end up being the one you want to use. It is definitely 11" I measured it myself. Didn't count the teeth, and it is setting on some blocks on the floor. If I have to count the teeth I can but I'd rather not hook it back up to the crane and count them if I don't have to. The reason I ask about the tooth count is because if you can't find a matching clutch, you will have to get a different flywheel. 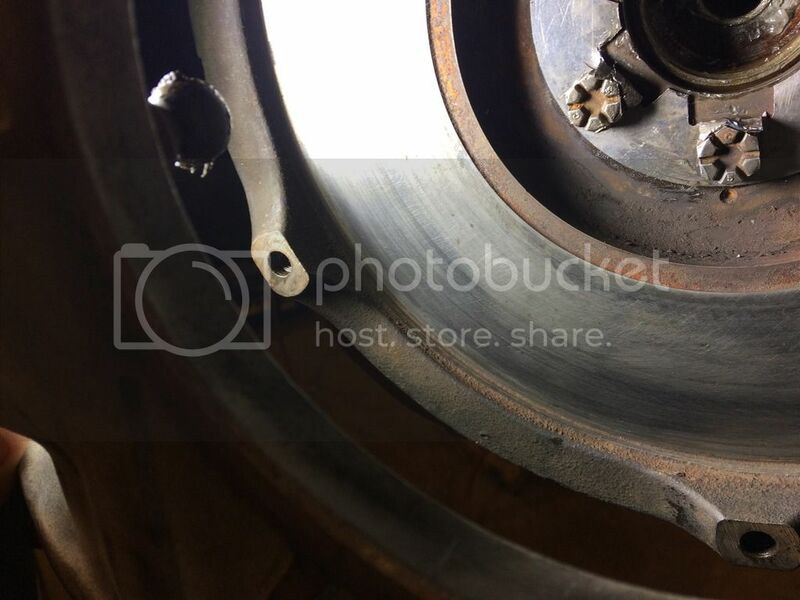 Since the starter bolts to the bellhousing, you will have to have the proper flywheel to line up the starter. Maybe someone has some info on a replacement for the clutch you have.